This is my ultimate looks-cool-and-also-sounds-good-too lick. Ditch the pick, put 2 hands on the fretboard, prepare for nonsense. I’d suggest being familiar with tapping, avoiding / muting string noise, and having a reasonable amount of hammer-on dexterity and finger strength before looking at this one. 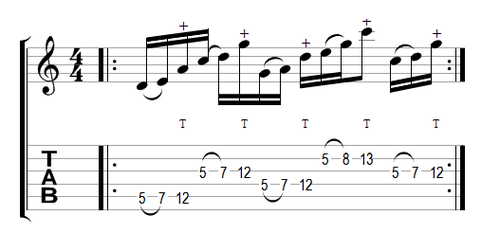 Here is the tab for this lesson, including performance directions, timing and phrasing. Note that all notes are semiquavers, except for the 13th fret on the B string which is a quaver, (ie, it needs to last twice as long as the other notes). On the B string, you also have the option to tap the note with either your 2nd or 3rd finger.